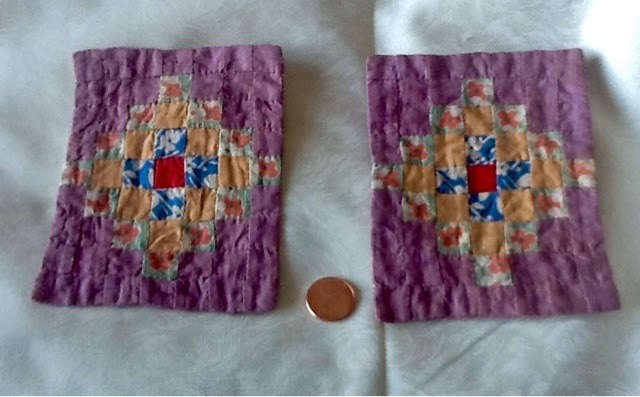 These are the tiniest quilts I have ever seen. Don’t recall where I got them, probably about 20 years ago. Some dear person made this Trip Around the World pair for a lucky girl with a dollhouse. They even have fussy cut peach flowers in the green squares. The front and back were stitched right sides together and turned, so no binding was needed. They are the highlight of my antique doll quilt collection. I hope these whet your appetite for the rest of them, which I will be showing every few weeks or so. Here is a quilt for my son, Chris, which I began when he was in college. 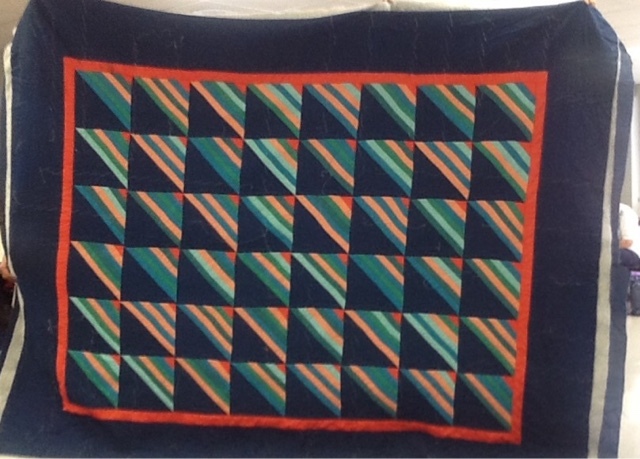 He wanted a black quilt, but I said, “No way.” I decided on dark blue with a simple Amish style pattern. I got it almost quilted when he got engaged and married. She had a different color scheme planned, so I put it away all these years. He lived through cancer and a divorce, then side effects in recent years. I hoped to finish it for him, but he passed away in April at age 47. Not long ago I read about Cynthia Brunz’s idea for volunteers to finish a quilt for another. I took the quilt to my local Monona Quilters and one of the members very kindly offered to finish the hand quilting and binding the quilt for me. 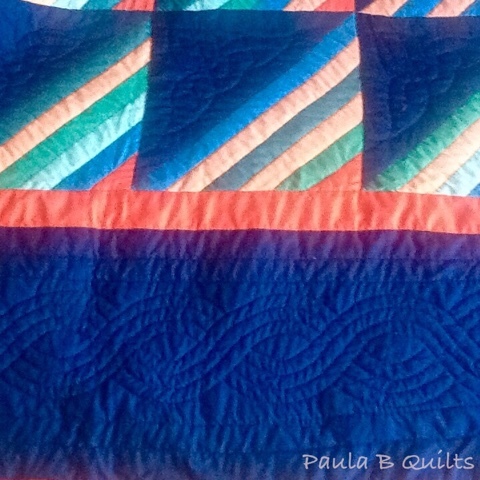 Here is the cable border and finished hand quilting beautifully done by Laura Gottlieb. This quilt will be my small tribute to Chris, who was taken too soon. I am grateful to have this new community of caring quilting friends, both near and far, who have helped me to focus on a way to give of myself and my talents now and in the future. During the history of American quilt making, pink was a difficult color to produce. Red was very popular, as in the Balrimore Album quilts of the 1850’s. After the Civil War a process of printing red and white tiny figures produced what was called “”double pink”. The binding is a stable red dye from the late 1800’s. It is with tiny black leafy twigs. The dark blue printed with white dots has not faded at all. That’s what is good about an old flimsie which shows the unfaded back colors. The reddish pink is somewhat transparent and shows that the pink is actually a darker tone now faded in streaks, apparently dyed but not printed. The two HSTs in the corner are faded light brown with tiny flowers overprinted on white. This piece is all hand pieced and dates to the late 1800’s. I link up with RSC15 at superscrappy.blogspot.com, Sew Cute Tuesday at blossomheartquilts.com and Throwback Thursday at kristaquilts.blogspot.com. Come join the fun.